Home Health Policies - On November 23, 2015, the Centers for Medicare & Medicaid Services (CMS) announced the release of the 2016 Medicare Durable Medical Equipment, Prosthetics, Orthotics and Supplies (DMEPOS) fee schedule amounts. The DMEPOS and Parenteral and Enteral Nutrition (PEN) public use files contain the 2016 fee schedule amounts for certain items that were adjusted based on information from the DMEPOS Competitive Bidding Program in accordance with sections 1834(a)(1)(F) and 1842(s)(3)(B) of the Social Security Act. The following is information associated with this change. Section 302 of the Medicare Prescription Drug, Improvement, and Modernization Act of 2003 (MMA) established requirements for a new competitive bidding program for certain DMEPOS items and services. The statute requires that “single payment amounts” replace the current Medicare DMEPOS fee schedule payment amounts for selected DMEPOS items in certain areas of the country. The single payment amounts are determined by using bids submitted by DMEPOS suppliers. The program is intended to set more appropriate DMEPOS payment amounts, which will reduce beneficiary out-of-pocket expenses and save the Medicare program money while ensuring beneficiary access to quality items and services. In addition, a national mail order program has been implemented for replacement of diabetic testing supplies such as test strips and lancets used with home blood glucose monitors. The single payment amounts established under this program are also used to set the fee schedule amounts for these diabetic testing supplies when they are picked up at local pharmacies. Section 1834(a)(1)(F)(ii) of the Social Security Act requires use of information on the payment determined under the competitive bidding programs to adjust the fee schedule amounts that would otherwise be used in making payment for DME furnished outside of the competitive bidding areas (CBAs) for these items. These adjustments must be made by no later than January 1, 2016. This requirement provides savings for the program and all beneficiaries without having to establish competitive bidding programs throughout the entire United States. Similarly, section 1842(s)(3)(B) of the Social Security Act provides discretion to use information on the payment determined under the competitive bidding programs to adjust the fee schedule amounts that would otherwise be used in making payment for enteral nutrients, supplies, and equipment furnished outside of the competitive bidding areas (CBAs) for these items. Phase in of DMEPOS Fee Schedule Adjustments - The adjustments to the DMEPOS fee schedule rates will be phased in so that, during the initial 6 months of 2016, the fee schedule amounts in all areas will be based on a 50/50 blend of current rates and adjusted rates. This will allow a 6-month transition period where health outcomes and access to these items and services can be closely monitored. For most DMEPOS items furnished in the contiguous United States, the adjustments to the fee schedule amounts will be made in different regions of the country based on information from competitive bidding programs conducted in each region. The amount of variation in the regionally adjusted rates will be limited by a national ceiling equal to 110 percent of the average of the regionally adjusted rates, and a national floor equal to 90 percent of the average of the regionally adjusted rates. Special Rule for Rural Areas – For an item or service included in 10 or more competitive bidding programs, a special rule was established for adjusting fee schedule amounts used in making payment for the item or service in areas within the contiguous United States that are defined as “rural” areas. For the purpose of implementing this rule, a rural area is defined as a geographic area represented by a postal zip code if at least 50 percent of the total area included in the zip code is outside any MSA. In addition, a rural area includes a geographic area represented by a postal zip code that is a low population density area excluded from a competitive bidding area. For example, using authority in the statute, low population density areas in much of the eastern section of the Riverside-San Bernardino-Ontario MSA in California, were excluded from the CBA established for that MSA, and these areas are defined as rural areas for the purpose of implementing this rule. For these areas, in no case will a fee schedule amount for any DMEPOS item furnished in the area be reduced below the national ceiling amount mentioned above. For example, the regionally adjusted rate for January 2016 for oxygen and oxygen equipment for the region that includes the states of California, Nevada, Oregon, and Washington, is limited by the national floor amount mentioned above. For all areas in these states that meet the definition of a rural area, the adjusted fee schedule amount for oxygen and oxygen equipment furnished in these areas will be set based on the national ceiling amount rather than the national floor amount, which is a 20 percent difference. As noted above, the fee schedule amounts from January thru June of 2016 will be based on a 50/50 blend of current rates and adjusted rates, so the maximum difference between the fees for urban areas versus rural areas will not be realized until July 2016. Fee schedule amounts for areas outside the contiguous United States (i.e., noncontiguous areas such as Alaska, Hawaii, and Puerto Rico) are adjusted so that they are equal to the higher of the average of the (single payment) competitive bidding payment amounts for CBAs in areas outside the contiguous United States (currently only applicable Honolulu, Hawaii) or the national ceiling amount. Fee schedule amounts for DMEPOS items included in 10 or fewer CBAs are adjusted so that they are equal to 110 percent of the average of the competitive bidding payment amounts established for each of the areas. The average of the competitive bidding payment amounts will be a straight average and will not be weighted (e.g., based on the volume of items furnished in each of the competitive bidding areas). 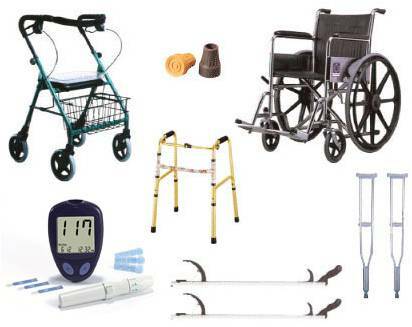 Items subject to this methodology as of January 2016, include commode chairs, nebulizers, infusion pumps, patient lifts, seat lifts, TENS devices, Group 2 complex rehabilitative power wheelchairs, and certain wheelchair accessories. For these items, this methodology applies to all areas (i.e., non-contiguous and contiguous). Below are examples of average savings based on payments using the blended rates for the first 6 months of 2016 for three commonly used rental items: an oxygen concentrator (E1390), a hospital bed (E0260), and a powered pressure-reducing air mattress (E0277). Under the current fee schedule, the supplier is paid $1,086, on average, for furnishing an oxygen concentrator for 6 months, of which the beneficiary pays $217 in coinsurance payments. Beginning January 1, 2016, the supplier will be paid $822 for furnishing the concentrator in urban areas under the fee schedule and $850 for furnishing the concentrator in rural areas under the fee schedule. The beneficiary’s coinsurance will drop from $217 to $164 in the urban areas and from $217 to $170 in the rural areas. Under the current fee schedule, the supplier is paid $705, on average, for furnishing a hospital bed for 6 months, of which the beneficiary pays $141 in coinsurance payments. Beginning January 1, 2016, the supplier will be paid $538 for furnishing the bed in urban areas under the fee schedule and $557 for furnishing the bed in rural areas under the fee schedule. The beneficiary’s coinsurance will drop from $141 to $108 in the urban areas and from $141 to $111 in the rural areas. Under the current fee schedule, the supplier is paid $3,478, on average, for furnishing a powered mattress for 6 months, of which the beneficiary pays $696 in coinsurance payments. Beginning January 1, 2016, the supplier will be paid $2,372 for furnishing the mattress and pump in urban areas under the fee schedule and $2,434 for furnishing the mattress and pump in rural areas under the fee schedule. The beneficiary’s coinsurance will drop from $696 to $474 in the urban areas and from $696 to $487 in the rural areas. Currently, a very sophisticated, real-time claims and health outcomes monitoring program is used to ensure that access to necessary items and services is not negatively affected by the competitive bidding programs. This program will be used to ensure that access to necessary DMEPOS items and services in non-CBAs of the country is not negatively affected by the initial blended rates during the 6-monthphase-in period. This program will also continue to monitor to ensure that access is preserved after the phase-in period, when the full adjustments take place.